Recently on Television Jackie Stewart was interviewed about the early days of his racing career and I was quite amazed at his comments. I later looked out a transcription of a taped chat I had with him in late January 1965 a few weeks after he had competed in his first ever Formula 1 race driving a Lotus 33 in the non-championship Rand Grand Prix. So why was it in South Africa and why was it in a Lotus just over two weeks before his BRM debut? To answer that we must go back to the British Grand Prix of 1964 when Jackie Stewart had a very full racing programme. He was due to race in no fewer than three of the British Grand Prix Support races. He was entered by Ecurie Ecosse in the sports car race with the Tojeiro GT which had started out with a Buick V8 engine but had been switched to a more powerful Ford engine. In the Touring Car race, he ran a factory Lotus-Cortina and finally John Coombs put Jackie in his Jaguar E type for the GT race. 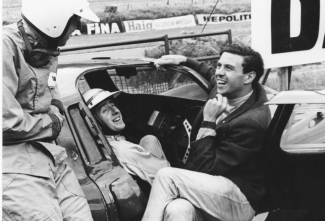 At that time Jackie, like most racing drivers of the period used to go to the events with some of his pals and this time I joined him along with Tim Morrison who was a whisky broker in Glasgow. We drove down to Brands in Tim’s father’s Humber Super Snipe and stayed at a small hotel beside the A20 dual carriageway near Brands Hatch. Practice went well for Jackie and we arrived back at the hotel after a heavy day. However, we had noticed that there was a large crowd at the circuit, even for practice, so that evening at dinner Jackie began to get worried. As he was running in three races and his first was fairly early in the morning he was concerned about getting to the track on time should our car be held up in traffic. Some spark suggested a bicycle and so we had a word with the manager and he had this ageing bike in a shed. 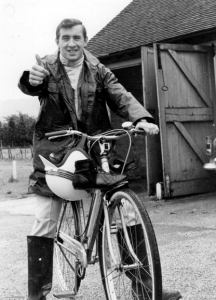 To Jackie that was the answer, he would set off earlier on the bike and cycle uphill on the dual carriageway to Brands Hatch. Next morning, with a wobble, he set off with his racing boots and helmet hanging from the handlebars. We went back into the hotel finished coffee and jumped into the Humber. Needless to say, we not only passed Jackie, his little legs going like pistons, but arrived at the circuit in plenty of time for me to photograph his arrival at the paddock. Suffice to say Jackie was in good form that weekend. He took third place behind John Whitmore and Jack Sears in Lotus Cortinas and in the GT race he looked like winning with John Coombs lightweight E type Jaguar but was finally overwhelmed by a furious Jack Sears in the Willment Cobra: Sears had been accused of starting from the wrong position, was called into the pits then released. The Ecosse Tojeiro-Ford was struggling but Jackie got the maximum out of it, though not enough to win. However, the previous day at Brands Hatch and as the spectators were leaving the circuit in the late afternoon after practice, a telephone call from race control to the marshals around the track asked them politely if they would not mind hanging on for another twenty minutes or so. 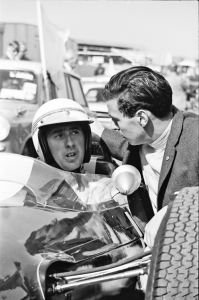 The reason was that Jim Clark had persuaded Colin Chapman to let Jackie Stewart try out the reserve Lotus Formula 1 car. As a result, Jackie climbed into a Formula 1 car for the first time in the paddock with Jim Clark beside him giving advice. He had no special seat and the belts were adjusted to fit him even though he and Clark were roughly the same build. The pit lane was opened and the departing crowd saw a green Lotus with a yellow stripe go out onto the track and start to run around. After only a few laps the engine failed and Jackie’s short run was over but it was enough to impress Chapman. Five months later Jackie received a telephone call from Colin Chapman asking him if he would like to race a Lotus at the Rand Grand Prix and so he raced a Lotus before he raced a BRM. However, to get back to my opening remarks about a recent interview with Jackie Stewart on television’ What struck me reading my interview recorded fifty years before, was how accurate Jackie’s views about himself today tied in exactly with what he said in that interview showing that he was not afraid to face his perceived weaknesses even then, and was under no illusion he was going to be successful in Formula 1. For example, when I asked him how he intended to plan his first season in World Championship formula 1. 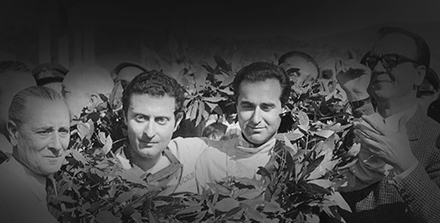 “During 1964 I had the good fortune to drive a number of competitive motor cars and had a number of successes but this year in Formula 1 I am going to have to start from the bottom of the ladder again……I think a lot of people in the same position would start off by thinking that because they had won a number of races the previous year they could expect to do the same the following year. This is just impossible for me, I know it is impossible. From my own experience even recently in South Africa ( In the Lotus) I went out there with a completely new car which had a lot of things to be sorted out. I didn’t get the practice I wanted to get and I think had I had more practice I would have enjoyed the race more for I would have had the car handling as I wanted it. 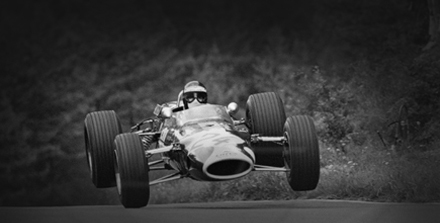 “Even at that, I realised that if my car had been properly set up I wouldn’t have been anywhere near as quick as the opposition…I couldn’t see myself within a second of Graham Hill, say or even a second and a half and this just makes it perfectly clear to me you have to learn how to do this, it is a different way of driving altogether”. I also asked him whether he still felt that Formula Junior – which was at its height – was still a good way to start out. His reply was very much to the point. “I can’t remember actually saying that. I remember saying I wouldn’t drive in Formula Junior for love or money because at that time I reckoned it was just bloody dangerous. The way I have gone into single-seaters has been the nicest and easiest way, through Formula III but you still have to keep your hand in with big cars because anyone who keeps driving small cars finds it terribly difficult to jump into a big car again and vice-versa”. “ I think it taught me a lot more about race craft as such, of biding your time or trying to get the hell out of the road. In Formula III if you slackened up slightly you could put the steam on and get back up there but in Formula II couldn’t do that. The competition was so strong that if you slackened and someone passed you just couldn’t catch up again. I asked him to compare the Lotus he drove in Formula II with the Cooper he drove in Formula 3: “..I found the Cooper was a very neutral handling car, very forgiving in many ways, whereas the Lotus was a more precise motor car and the rear end of the Lotus was one of the nicest handling ones I’ve ever had. The front end I wasn’t so happy about for it wasn’t so forgiving as in the Cooper”. In 1964 Jackie had a hectic year in a variety of cars. Was this necessary? “ Last year I had fifty-three starts and I’d hope that I wouldn’t have as many as that this year. I did it for a reason. I was determined to establish myself and take up as may good offers as I could. This year (1965) I don’t think I will have the success I had last year, I can’t hope to as I will not be driving in the same sort of races. But I hope that when I am driving in a British meeting I’ll get at least two starts a day; three is a bit much I found last year because on one occasion I drove for seven solid hours in different types of car and that’s too much”. “ I could have driven a Formula 1 car at Solitude in 1964 but I turned it down because I thought it was going to be too big a step too soon. Now, I think if someone had really pushed me I might have taken it up but I am glad I didn’t. In fact, I wasn’t going to drive the Formula 1 Lotus in the Rand Grand Prix a few weeks ago because I felt I should drive my first Formula 1 race with BRM. 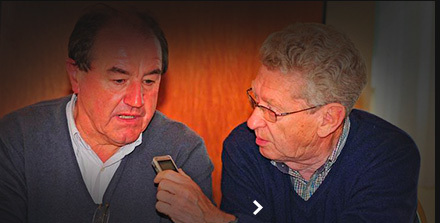 “I telephoned Ken Tyrrell and asked his advice. He said ‘ don’t be such a stick in the mud, you’ve got to get out and drive the thing sometime’ and pointed out that this Formula 1 scamper would calm my nerves rather than taking my first appearance in a full-scale Grande Epreuve. I think from that aspect I couldn’t have done better than drive at Kyalami and perhaps I wouldn’t have done it if someone hadn’t kicked me in the backside and told me to get on with it”. Then came his answer to my last question which was, what is your motivation for racing, wealth or success? His answer, below, was given, remember, fifty years ago and I have never published it. However, I think it underlined his motivation then, as it does his motivation today. One wonders if a modern day Grand Prix driver has such simplistic ambitions.